Planning a Disney World vacation is no easy feat, but our friends at the Disney Food Blog have a great tool that will make planning your dining adventures easier and a lot of fun – the DFB Guide to Walt Disney World Dining. This full-color, instantly downloadable e-book feature more than 650 pages of everything you need to know about dining at Disney World! And it’s been updated with the most recent 2017 Disney dining news. Inside the guide you’ll find fully updated menus, prices, and restaurant information for every Disney World restaurant, bar, and kiosk; DFB’s recommendations for restaurants; Disney Dining Plan cost analysis; an updated snacks chapter; and much more. There are also sections on what’s new and what’s coming to all the theme parks, resorts, and Disney Springs; four downloadable worksheets to make your planning easier; must-try snacks for 2017; and tips for making the most of your dining dollar at Disney. 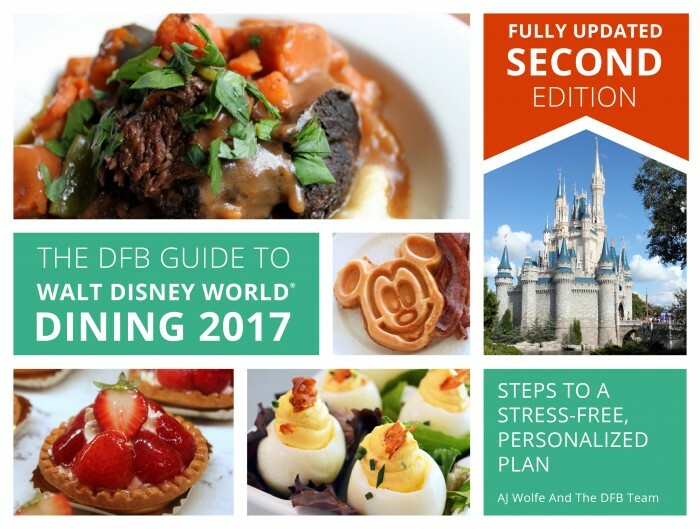 For a limited time you can get the DFB Guide to Walt Disney World Dining 2017 2nd Edition for 25 percent off with the code WDW2017. There’s always a 100 percent money-back guarantee on all the DFB Guides too! And they’re easily downloadable to your smartphone or tablet for easy access in the parks! For more information or to purchase the DFB Guide to Walt Disney World Dining 2017 2nd Edition visit the DFBStore.